Are you getting more use out of your hot tub or spa now that swim season is over? If so, you may wonder how to save money on your hot tub, its operation and the maintenance and cleaning of it. 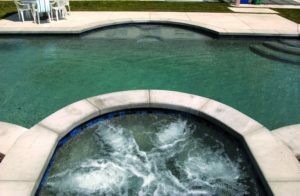 Work with the swimming pool and hot tub contractors from Imperial Pool Builders to assure your hot tub is running as efficiently and effectively as it can. A spa or a hot tub will require maintenance because the heat of the water, combined with the organic bacteria that those who use it will. Bacteria will grow more quickly in the heated water of a hot tub. Is the hot tub structure insulated? When making decisions on the hot tub or spa, make sure it’s environmentally friendly and well-insulated to help save money on the costs of heating. When you’re buying the hot tub, ask how much insulation it, and its shell, has. Check the R-factor and make sure it is at least R40. Ask your hot tub contractor for the R factor. Be diligent in the use of the hot tub cover. Purchase a hot tub cover when you buy the hot tub. Diligent use of a cover will help keep the water clean, will slow the rate of evaporation and will trap the heated water — saving you money. The pump doesn’t have to operate at top speed all of the time. Run it on a lower speed if all you’re doing is circulating the chemicals. Specially-designed variable speed pumps operate at a lower horsepower and this keeps your electric bill in line. Ask how recirculating the heat from the pump can be used to help heat the water – this can extend the life of the pump. You will need to have the hot tub drained on occasion, depending on how often it is used. Instead of just dumping the water out, use it to irrigate your lawns. If you recycle the water don’t add chemicals to the water before you drain it – for three days prior. If you’re not going to use your it for a while – even a few days – turn the temperature down a few degrees to save money. Also, you might be able to drop the temperature a degree or two for regular soaking time and it might not even be noticeable. Ask us for other options for saving money on the operating costs of your hot tub or spa.